Intel is partnering with Dell, HP, and Lenovo, though other partners will undoubtedly sign on. 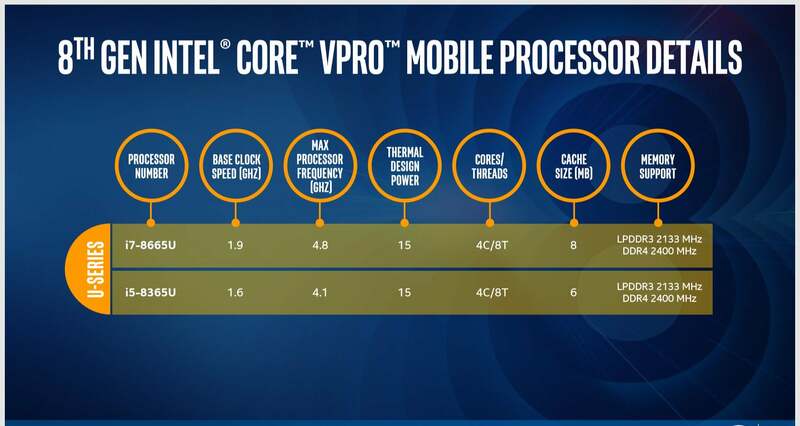 Intel has two 8th-gen vPro chips for sale to business customers. Intel trotted out the usual performance comparisons—the Core i7-8665 offers 65 percent more performance than a three-year-old PC, for example—and said that the platform could offer up to 11 hours of battery life. Platform technologies have been one of the defining characteristics of the vPro platform, from anti-theft and remote keyboard-video-mouse (KVM) software several years ago, to biometric authentication at the chip level. For the eighth generation of vPro, Intel has turned again to security, with a technology called Intel Hardware Shield. According to Intel, Hardware Shield “helps ensure your OS runs on legitimate hardware and provides hardware to software security visibility, enabling the OS to enforce a more complete security policy.” Rather than assist the average worker, it’s designed to improve the security of the enterprise’s overall IT department. In addition to Hardware Shield, however, there are two other key platform technologies tied to vPro: Optane, which Intel just combined with SSD storage on the H10 card; and the new Wi-Fi 6 (802.11ax) standard, which is appearing on more platforms as a way to increase bandwidth and compensate for network congestion. What this means for you: Commercial customers demand rock-solid reliability and security from their PCs, along with productivity. Now that Intel has some competition from Ryzen Pro, corporate users should enjoy the luxury of choice when they buy their next round of business machines.